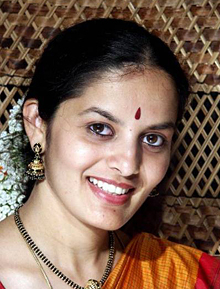 Sridevi Ajai Thirumalai is the Artistic Director of Natyamani School of Dance. Sridevi is an acclaimed Bharatanatyam dancer who has earned accolades for her pure interpretation of classical traditions. Her choreography is a reflection of her passion for perfection and grace. Sridevi was introduced to Bharatanatyam at the age of 5 by her mother, who nurtured her early talent. She has trained under gurus Padmini Ramachandran, Narmada, and Rhadha in India. Sridevi has performed extensively in India and the US with solo programs and dance productions with her senior students. She has directed and choreographed numerous productions including Siva Sakthi, Nritya Kalai, Natyanjali, Om Namo Narayana, Kshetra, and the Annual Day productions for Natyamani School of Dance. In 2010 her students performed in Tridevi Samarpanam, a fund raiser for Kanchi Kamakoti Peetham. Sridevi established Natyamani School of Dance in 1992 to fulfill a dream of sharing her divine gift with aspiring dancers of all ages. Over 40 students have completed their Arangetrams under Sridevi’s tutelage. Her choreography for each arangetram reflects her depth of knowledge of the art as well as the student. Her productions have received excellent reviews for their innovative choreography, excellent synchronization and expressive abhinaya. Sridevi’s teaching style reflects her high expectations and her objective to bring out the best in each student. Her teaching instills not only a love for the art but also teaches the value of dedication, perseverance, and the pursuit of excellence. Sridevi’s awards and recognitions include the Best Dancer Award from Nrithya Kala Parishad, Senior Government of India Scholarship for talented artists, and being bestowed the title of NATYA THAPASVINI. In 2007, Sridevi was invited to perform in Amsterdam and also conduct a master class for senior dance students in Holland. She performed at the “Boston History & Innovation Collaborative” Award Ceremony which felicitates famous Bostonians for their outstanding contributions. Sridevi was also invited to perform at Bangalore, Bhuvaneshwar and Boston for Akshaya Patra, a non-profit organization which provides mid-day meals to over 1.3 million school children in India every day. Sridevi received a grant in 2008 from the Institute for Community Research for Southern New England Folk and Traditional Arts Apprenticeship Program. In 2009, she participated in Navarasa Nayika, a fund raiser for MITHAS. In 2012, Sridevi choreographed and directed the dance production Kshetra that served both as a fund raiser for Akshaya Patra and as a celebration of Natyamani’s 20 year anniversary.